Let’s look at the ridiculousness of this case thus far. 1. Stephen Paddock was a professional gambler who made a living off of video poker. A successful casino gambler can only be found riding unicorns. Supposedly a rich real estate guy, but no one knows of any holdings or transactions in his name. Throughout his employment career, he worked for the post office and the IRS. It seems they pay extremely well since real estate investing needs quite a bit of seed money. 2. Jesus Campos was security guard who was shot when he knocked on the door of Paddocks room. But only, he wasn’t shot then, but 6 minutes before the shooting began. And didn’t bring the police/security to the room until 58 people were dead and nearly 500 people were critically injured. 3. Jesus Campos’s is guarded by someone who works for a non-existent security company with no physical address and who’s license to operate ran out last year. 4. Stephen Paddock’s house gets robbed while the FBI is combing over it for evidence…. No further words needed here. 7. Hotel casinos, the single most extensively surveilled buildings in the world, can not produce even ONE clip of Paddock going on about his business. 8. Has 23 guns and dozens of loaded magazines. But takes over a minute between volleys of fire. 9. No trails of social media exists for Stephen Paddock. Nothing at all. Paddock must have not known that the internet existed. Is anyone buying this? Is anyone foolish enough to think that this was a planned mass murder by a crazy guy? Anyone wanna add to the list? 11. The alleged shooter had a beard but the body found was clean shaven. 13. If he was the shooter, his suite should have been littered with 1,000s of shell casings. 14. There are shell casings on top of the blood, which means he kept firing after he was already dead. 15. Some of the shell casings are for blanks and others are CO2 cartridges, as Scott Bennett has observed. 16. A military surgeon has informed Paul Craig Roberts that the hospital "victims" are actors with fake wounds. 17. 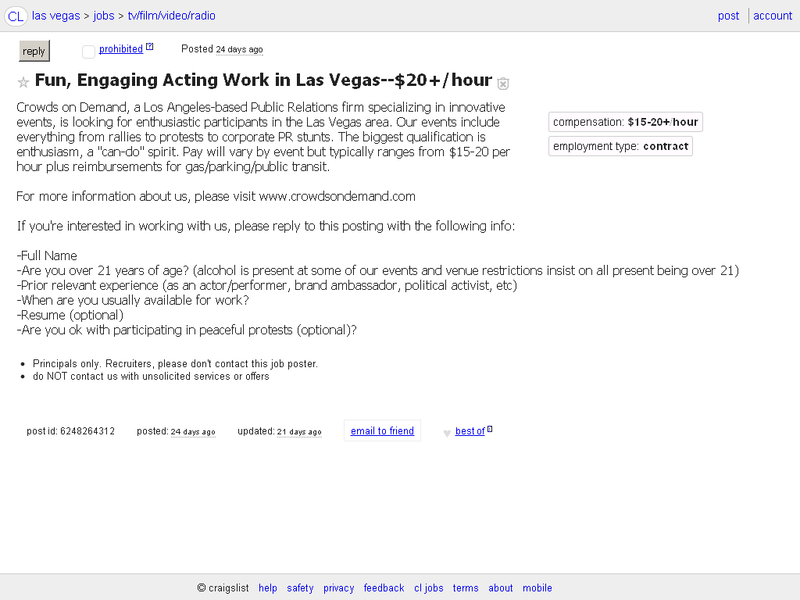 Crowds on Demand was recruiting for crisis actors in Las Vegas 15 days before the event. 18. The CEO of Mandayal Bay sold off most of his stock in advance of the shooting. 19. George Soros bet $42 million against Mandalay Bay and MGM last quarter. 20. The FBI has wiped clean the witnesses cell phones and computers. 21. A Facebook friend called the three closest hospitals and none of them had received gun-shot victims. 22, So I called the same hospitals: one said "No comment", the others confirmed no gun-shot victims. 23. He is said to have fired 200 rounds in the hallway of this luxury hotel and no one noticed the shots. 24. It reportedly took the police 72 minutes to determine which room he was in and to finally storm it. 25. He was playing poker with his girl friend's card for future benefits until shortly before the shooting. 26. No surveillance footage has emerged of him at any of the Las Vegas casinos or in the hotel itself. 27. He is supposed to have used the service or the freight elevator, which would require special keys. 28. Jesus Campos is supposed to be a security guard, but he is not listed as a security guard in NV. 29. Chief M.D. says "mass casualty incident disaster drill" was initiated after the shooting massacre. 30. The Chertoff Group now stands to make billions on sales of TSA-style full-body X-ray scanners. 31. Bipods on a rifles with bump stocks? Bipod is useless with a bump stock. 32. Shots seem to be coming from the center of the hotel, rather than from the 32nd floor. 33. Scott Bennett noticed they were continuous from the 4th floor w/ bursts of 3 from higher. 34. Another video shows a shooter on the ground, dressed as a cop, also firing into the crowd. 35. The Sheriff says he's heard rumors of more than one shooter, but has yet to see any proof. 36. But there's proof in "Scott Bennett: Overlooked Evidence in Las Vegas and Paddock Photos". 37. The shots being fired, however, may perhaps be blanks rather than real high-velocity rounds. 38. We need proof that some present for the concert, who were not among the crisis actors, died. 39. Robert David Steele and State of the Nation suggest that this was a hybrid, part real, part fake. 40. What an absurd situation that we no longer know whether a mass shooting is real or Memorex. 43. The gun grab script already in place for instant mainstream media regurgitation. 46. He suffered from allergies, so his girlfriend could not use hair spray, perfume or bubble bath. He would have choked on the smoke created by the preposterous shooting. 47. A technician adds (as a comment on my blog) that the smoke detectors would have been set off by the smoke, which means the smoke alarm should have sounded loudly. 48. The 32nd floor housekeeping personnel were ordered not to come in the day of the shooting, further proof that this was an "inside job" and that Paddock was being framed. 49. A massacre survivor has died abruptly after posting her detailed eyewitness account of apparent multiple shooters on facebook "of natural causes" when she was only 28. 50. The police are baffled that one of the homes (in Reno) of the suspected mass murderer was broken into, not considering that it may have been to plant fake evidence. 51. There was a guy pulled over for a traffic violation in Tennessee 2 days after the shooting and arrested. He had a cache of automatic firearms in his vehicle. Can't remember his name (Elliot or Ellis) but somehow linked to Paddock. Nothing being mentioned in the media. I will try to find the link. 52. The windows on the 32nd floor of the MB hotel were intact and not broken out until after the shootings, yet a "lone gunman" did all of the shooting from those windows. Yeah. A passerby at the Mesquite house shortly after the shooting and immediately after the FBI was there said that there was no crime tape up and the front door was left WIDE OPEN. That is what I call an "invitation"
Your questions are just the tip of many that we deserve answers to. The fact that we are not being provided with the answers that our employees (FBI) are obligated to provide to us makes them guilty of insubordination and is cause for termination for not meeting their job requirements, as would happen to any one of us with our own jobs and rightly so. By falsifying information and ignoring critical evidence makes them more of an accessory to the crime than a means of providing justice. The Federal Bureau of Insubordination! The fact that the FBI is actively engaged in systematically wiping any and all possible evidence of a second shooter instead of actually following up on the possible evidence as leads, as would be done if conducting a professional and sincere investigation, is in itself enough to call the entire official narrative a complete sham. In addition, how is it even possible to conclude that the shooting was the work of a lone gunman so soon after it happened without doing any firearm forensics and scientific analysis such as bullet trajectories, ballistic tests to match bullet to a specific gun barrel etc. That is what a real investigation entails and can answer a lot of questions and provide evidence to back up their claim that a lone gunman did all of the shooting from the 32nd floor of the MB hotel. Without these details there is no possible way that they can realistically come to any legitimate conclusion one way or another. The fact that they are not doing a legitimate investigation puts their integrity into question and leaves us guessing as to why they would do something like that especially when they are called the "Federal Bureau of INVESTIGATION". They are not investigating anything! Only trying to manipulate the timeline and provide a false narrative as to how it went down! All crimes committed after the shootings are being committed by law enforcement! The most important question that needs to be answered immediately is "Why is the FBI ignoring all eyewitness accounts, wiping evidence off of peoples phones and discounting any evidence or leads that might provide evidence to a logical and scientifically based conclusion to the incident?" Why is the FBI actively engaged in falsifying the official narrative instead of doing a real investigation as required according to their job description? Until these questions are answered, anything thing that the FBI reports can not be taken seriously but can be legitimately labeled as false information and considered as a criminal action worthy of prosecution by the people that they are supposed to represent! Those who have been publicly identified as "victims" of the 1 October 2017 shooting in Las Vegas, it turns out, died at other times and other locations and of other causes . Some of the m do not even exist but were created through a photo-shop program that produces the illusion of an entirely different person. If this seem initially unbelievable , when you finish this article , look back at the photos of the victims and see if you can find the same person in many of the others. This study will uncover the beginning of the research conducted to this date, with new findings to follow. It is important that Americans pay attention, stand-up and demand answers and not relinquish until the entire truth comes out. If Americans remain apathetic, in denial, or just plain lazy, we run the risk of losing all freedom , including what 's left of the right to bear arms. It is difficult to wrap one's mind around a government so corrupt that it could orchestrate a " false flag" event this elaborate, until you reflect upon "Operation Northwoods" of 1962. This unclassified document should be read by every American to teach them the lengths the US government will go to to fund its wars and continue to enslave its own people. 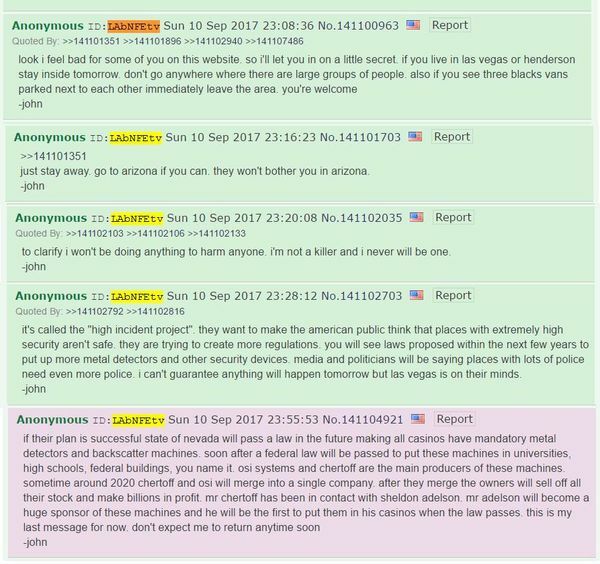 There’s a segment of the world wide web that has been calling the mass shooting in Las Vegas on 1 October a "staged event" or a " false flag". The brave souls who have been going with their gut feelings after watching the production unfold on television have been getting blasted by the Mainstream Media and the Social Media , which at one time, but no longer, used to be the place to voice daring opinions. Even one's own peers have put the pressure on "conspiracy theorists" , who are preferably called "conspiracy realists" or "conspiracy analysts". This shooting was strikinglysimilar to the event in Newtown, CT, at Sandy Hook Elementary School in 2012 in the manner in which it was presented by the media. For those unfamiliar with the Sandy Hook school shooting, the book NOBODY DIED AT SANDY HOOK (2015) edited by Dr. James Fetzer ( from moonrockbooks.com in its 2nd edition but available for free as a pdf in its first) is the best way to catch up on " false flags" and hoaxes that our government conducts in collaboration with state and local authorities. Following that event, which turned out to be a two-day FEMA drill, conspiracy realists went to work and have effectively eviscerated the official account. Let this be true of Las Vegas, too. The first victim, Christopher Louis Roybal, born 10/09/1988 was listed as one of the victims of the shooting. However, after searching obituaries there was a discrepancy in the date listed as to when this person died. Both obituaries were found on Legacy.com and listed two different obituaries for Roybal with two different dates of death. The dates were 1 and 2 October 2017. A pattern was emerging that appeared to warrant more investigation. It was either missed by the production company that put together the shooting (Crowds on Demand) or else the title initially listed can not be changed. The content was changed but the search engine link , which was created first, tells the entire story. Mr. Roybal passed away , not in Las Vegas, NV, but in Corona , CA. The obituary , but not the search -engine heading for the obituary , was changed, a pattern that we will see emerge again and again. As with other examples examined here, the same problem occurs the obituary and search engine page -headline, where the link to the obituary is not the same. 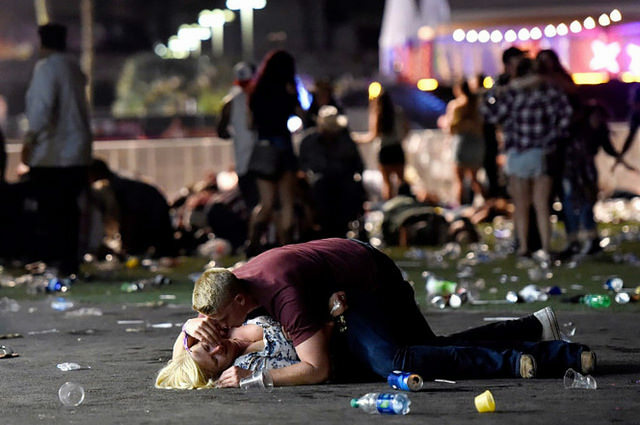 The eighteenth victim was Denise Burditus , who did die in Las Vegas, Nevada, but at a hospital on 2 October and not at the concert in her husband’s arms as he stated in an interview. She passed away at Spring Valley hospital with no mention of having been shot. The nineteenth victim is the last person even though there are more victims who died in their home state, but the proof will have to be presented at a later date when evidence is available. The nineteenth victim is the most confusing and took a minute to figure out. Here is the search engine title to tell you where the older Charleston died. He is the one buried at the Veterans Cemetery in Boulder City. Denita is the one in the pics that appears to be the children’s mother but she is really their grandmother. The woman standing with her is the children’s mother, Veronica, and they are mourning their grandfather, thank God, not their Dad. The younger Charleston is still alive and working in San Bernardino, since they are the ones that listed his picture as a cop or he could be in the military in another state. He is also the one that is in the National Guard or could now be active duty someplace other than Las Vegas. We should also look at the alleged shooter, Stephen Paddock, and his son, Eric Paddock. My suspicion is that Stephen and Eric probably work for the FBI, where they , as a team, brought the crime scene props, including 23 assault weapons, to the Mandalay Bay suite room and staged the scene there. That is why the police and the FBI do not want to look for a second or a third shooter, in spite of overwhelming evidence that multiple shooters were simulated by video special effects that accompanied the audio special effects: the sounds of automatic weapons firing. According to the official narrative, Stephen is the one and only shooter--and they want to stick with the script! All big one big happy drill that the American public were not in on. The crowd at the concert were not in the know and that is why they ran to get away at the sound of gun shots. After everyone was gone , the stage lights went on and the actors got to work setting up the crime scene. There were people who were hurt running away, but no one appears to have been actually shot --and if someone claims they were, then it requires proof by showing the gun wound and medical records (which, alas, can also be faked). The expert analyses of a military surgeon and by an American trauma surgeon, who confirmed that all of the patients shown in hospital rooms are acting, where none of their alleged wounds is real, the presumption should be that the other "victims" are also fake. Overall, it should be evident that all of these errors in the obituaries are not just just a coincidence along with the rest of the puzzle being added to this article. With the police changing their story, the FBI deleting video recordings on witness phones and laptops, the review of alleged "victims" presented here shows that, time and time again, they were using person who had died in different places or on different dates or in different states and from different causes of death. The Clark County Coroner's Office is on lock-down, no doubt because it would have been besieged with requests for death certificates and autopsy reports--and they don't have any! We even have a photograph showing bodies being moved from a funeral home hearse for transport to be used as additional "victims" of the Las Vegas shooting. This study has reviewed twenty of the purported "victims" of the Las Vegas event (counting Paddock among the victims, which appears to be appropriate. Twenty is less that the fifty-eight who are alleged to have died. But it establishes a prima facie case in support of the conclusion that the "victims" were fabricated and that nobody died at the concert. In the absence of authentic e vidence sufficient to overcome that presumption, that inference deserves acceptance in the tentative and fallible fashion of science. The proof of fakery appears to increase by the day. With access to additional evidence, we have the prospect of confirming or disconfirming the best supported hypothesis, which is that the Las Vegas event was not real but was a movie: a made-for-television production. So much has emerged about those who benefit by selling their stock (only to buy it back at a vastly reduced price), by putting shorts on MGM/Mandalay Bay (to make vast sums if the stock should drop) and even the prediction that scanners will now be required at every hotel and casino. There are other fringe benefits, but it certainly looks as though buying extras via CrowdsonDemand was a cost-effective expenditure.